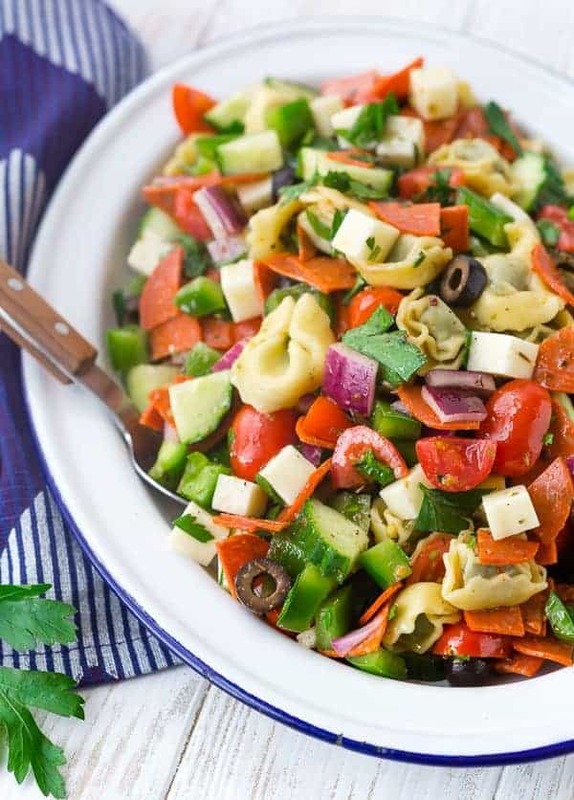 This is a classic tortellini pasta salad that’s perfect for cookouts, BBQs, and potlucks! 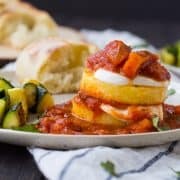 It’s a universal crowd-pleaser thanks to cheesy pasta pockets and all the other fresh and flavorful ingredients. Make it for your next picnic! I’m coming at you with another pasta salad recipe because it looks as though warm weather is finally going to stick around for awhile! 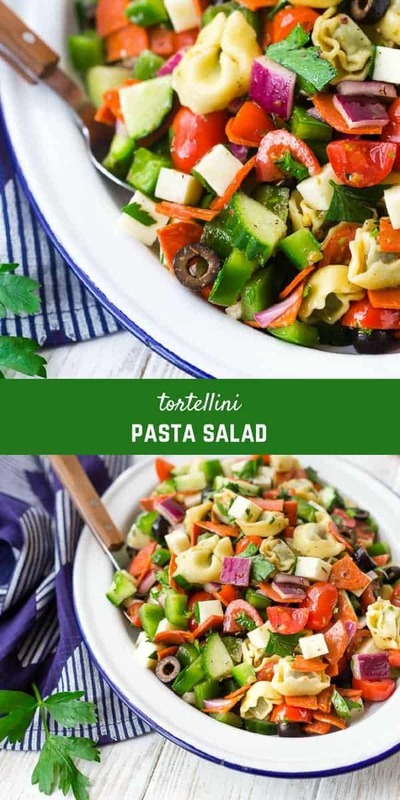 With lots of picnics and BBQs coming up, and this tortellini pasta salad is absolutely perfection for any cookout. With our basement finished, I have been really itching to have some people over! Well, we don’t have furniture down there yet, so I should probably cool my jets a little. Side note: It’s coming this week! I can’t wait. We actually bought new furniture for our living room and we’re moving our current living room furniture to the basement. I’m also itching to perk up our outdoor space – we want to expand our patio, but in general, I need to do some spring cleaning up. The patio will have to wait for a bit (basements and roofs are expensive! ), but it doesn’t keep me from dreaming about plans! 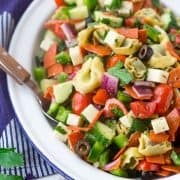 This tortellini pasta salad is a major crowd pleaser with classic pasta salad ingredients like green peppers, olives, onions, pepperoni and flavorful chunks of cheese. I can never get enough vegetables so I also added cucumber and tomatoes. I finished it off with tons of fresh parsley to brighten things up and an easy homemade vinaigrette to bring everything together. As always, this is a recipe you can have fun with and make your own! If you don’t like one of the ingredients, leave it out! 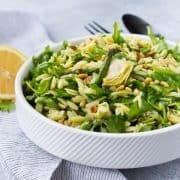 There is a lot going on in this salad (in a good way), so the omission of one ingredient won’t make a huge difference. I mean…don’t leave the tortellini out…that’s a given, right? Vegetarian? Leave out the pepperoni. Like it a little on the spicy side? Add more red pepper flakes to taste. Have fun with the cheese. I used mozzarella (it was fitting for the Italian vibe of this pasta salad, but it was also maaaaybe because it’s what I had), but provolone or cheddar would also be delicious. Tip: If you’re making this in advance, the pasta may soak up some of the vinaigrette. Happy BBQing friends! You are going to adore this salad. I can’t wait to make it again. In a large bowl, combine cooked and cooled tortellini with bell pepper, grape tomatoes, cucumber, red onions, mozzarella, pepperoni, olives, and parsley. In a small bowl or measuring cup, whisk together dressing ingredients: olive oil, red wine vinegar, oregano, garlic powder, red pepper flakes. Taste and season with salt and pepper as needed. You can also add a bit of sugar or agave to dressing to sweeten it if you don’t prefer it as tangy as we do. 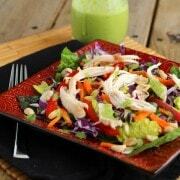 Pour dressing over salad and stir to combine all ingredients and coat with dressing. Husband’s take: Ben feels the same way I do about onions and olives, but aside from that, he had absolutely no complaints about this pasta salad. Changes I would make: None are necessary! If you really don’t like a particular vegetable, you could leave it out for sure. You could also make this vegetarian by omitting the pepperoni. Made this salad for a BBQ everyone loved it. That makes me so happy! Thanks for taking the time to come back and leave a comment! All those fresh veggies have my mouth watering! Yum! They make it so good! Thanks! This looks great! I love all the different colors! Great Recipe! This is such a refreshing recipe! Thank you for sharing!